This species is currently stable. It is found throughout the Mississippi River basin from western Ohio and Michigan west to South Dakota, south to Oklahoma, Texas, Louisiana, and Mississippi, although it has disappeared from many regions in the northern parts of its range. It also occurs in the lower Cumberland River system of Tennessee and Kentucky. 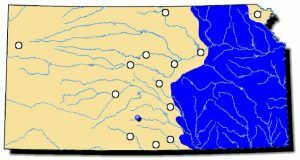 Comments: Unlike its cousin, the black sandshell, the pondmussel is common in Kansas. It is found in decent numbers in a large variety of habitats including ponds and pools of small streams or rivers. 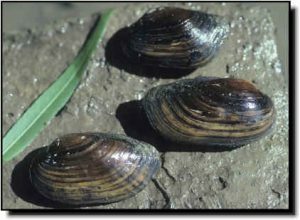 The pondmussel can withstand the drying conditions often associated with pond habitats by surviving for long periods in the moist substrate. Like other mussels in this group, the female is more inflated and is not nearly as pointed at the posterior end to provide space for the numerous maturing eggs and glochidia. The most defining character of this shell is the noticeable fine ridges (sculpturing) on the umbo that are drawn up in the center appearing as inverted Vs. The dark brown shell may have dark green rays but the shells tend to blacken with age. The nacre is bluish-white.